Worldly Cuisine African Sunset 2oz. Wheat, Pasta, Flaxseed, Chopped Almond, Cashew Pieces, Dehydrated Cranberries, Papaya Granules, Pineapple Granules, Sweet Potato Dices, Cinnamon Powder, Dried Kelp, Tomato, Spinach, Annatto. Worldly Cuisine Creamy Zen 2oz. 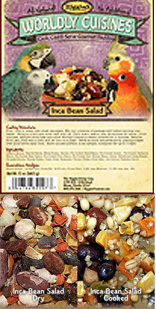 Worldly Cuisine Inca Bean Salad 2oz. 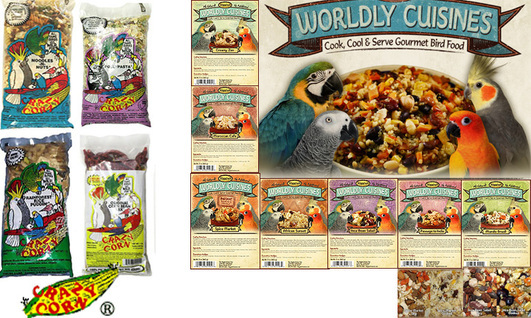 A six bean and healthy quinoa blend inspired by South American cuisines. Includes black, pinto, red kidney, garbanzo, navy and lentil beans as well as sweet peppers, carrots, tomatoes and more all mixed in bed of pre-rinsed quinoa. Worldly Cuisine Moroccan Cafe 2oz. Worldly Cuisine Spice Market 2oz. A taste inspired by the flavors of the Middle East with raisins, dates, almonds, sweet potatoes and more all mixed in a blend of couscous pasta and cinnamon, ginger and anise. Worldly Cuisine Tuscan Dream 2oz. A taste inspired by the gardens of Tuscany with tomatoes, celery, onions, carrots , chopped almonds and much more all mixed in a bed of couscous pasta. Ingredients: Pasta, Cracked Wheat, Hulled Millet, Rolled Oats, Carrot Granules, Chopped Almond, Dried Celery, Potato Dices, Tomato Flakes, Dried Parsley, Vegetable Broth, Dried Kelp, Spinach, Annatto.